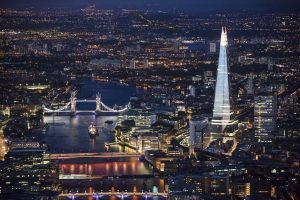 Halfway up the erected Shard – this (bawdy) symbol of London – on the 32nd floor and overlooking both the industrial, with its business buildings, bridges, fast roads, and the calmer, cozier, filled with houses and hills side of the capital is the good old Oblix. 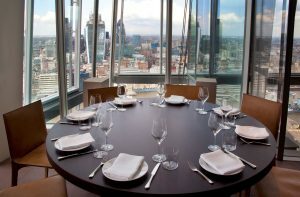 Oblix is one of the first restaurants which opened at The Shard, so to most Londonners it is quite well-known, at least by name and reputation. As you can imagine it is a typical platinum priced restaurant/bar. You need to book a table well in advance – weeks, to be precise – and during these weeks, do your best to save up for the bill at Oblix! It’s not that any other venue at the Shard would charge any less for the ‘outerior’ it offers, but what is important here are the ‘extra’ efforts aside from the view which was there all along. What you first see right after the long and a bit tensioning climb up with the elevator is a long tunnel. Yes, it’s basically a tunnel; a dark, seemingly endless hallway which comes in combination with several dozens of gatekeepers as if you are trying to visit a convict waiting to be guillotined before the people of a village in the 16th century. After you cross the irrelevant tunnel and the tiring check, you enter the Oblix itself and you can choose to continue to the bar or to the restaurant. The restaurant has an open kitchen and you can eye all the chefs (not that you’ll miss anything if you don’t…) from the very first minute. Open kitchens are usually a plus – you feel personally included in the creation of your food, although for such a place it is strange to cook…publically. As for the bar, it has one main problem – no platforms for those who want to enjoy the view at its fullest. If you are seated at a window table – great, you will get quite the view. But many tables are a bit further away from the glass and there is no free space left to just go up to the windows and have a peek. You literally have to push through some other diners and squeeze in between them…So both the window seats and the distant seats are somehow forced to feel quite uncomfortable; this seems completely useless as a tactic. As a whole, the interior of Oblix is sadly predictable – dark wood, at times minimalistic, at others – tries to be contemporary chic; nothing that talks about individuality, not a trace of uniqueness. The food that Oblix offers, I think, is well tuned with its interior. From what I see, the initial and most substantial purpose of Oblix was to please the masses – impartial international décor coming with a menu that looks as what you expect to see when you type ‘Sample Restaurant Menu’ in Google Search. Typical dishes that are familiar to any potential client – Salmon, Beef, Tuna, Steaks, I would expect Cheeseburgers soon. What you eat at home, wherever home is, you will find at Oblix. They have obviously tried to add a personal touch by supplementing most dishes with a fruity side. Keep in mind that this often turns out to be just lemon curd. And as if being that mainstream is not enough, the very effort to vary typical dishes has worsened everything. The dressing that the kitchen mixes up manage to erase any taste of what you are eating, especially when it is some kind of meat. A toilet paper roll covered with that much ginger/lemon/soy/rosemary would taste absolutely the same! What was acceptable, at least for me, was the grilled diver scallops, king eryngii mushrooms & hazelnut, but that was probably a result of my flair for mushrooms, so I wouldn’t want to lead you on. A good thing about the food though is that some portions are large enough to be shared – if you are hesitating whether to order one for each, or share: just ask your waiter. 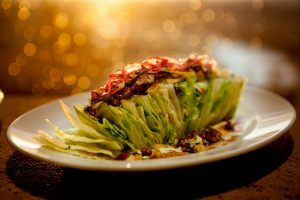 And what else should be mentioned is that both the restaurant and the bar offer similar menus; the one at the bar is a little bit shorter and plainer, but is still sufficient for a lunch or dinner. The cocktails at the bar are not that blunt, but not that spectacular either. Another unsurprising detail of Oblix is the staff – an army of model wanna-bes with a whole collection of different uniforms so that you get confused about which person to contact for which issue…Thankfully, the waiters are not utterly unresponsive, the speed of service is decent, which cannot be said for a lot of similar venues on the floors around. Well, tell me honestly, what do you expect from the prices? A huge overcharge for the famous London Shard view? Oh, why? As the other exemplars of its species, like Hutong, Aqua Shard, Gong and more, Oblix does put a confident price on its sole significant feature – the view. Otherwise, a £20-30 price range for a dish would sound even more ridiculous than it does now. You know in advance that you should be prepared to spend at least £50 per head for a night at Oblix. It is natural to complain about being forced to pay that much for a mediocre meal at a perfectly impersonal and unimpressive restaurant or bar. When we add the view over the capital of Britain, though, costs start looking more sensible. But here, at Oblix, the view is not always included! As I mentioned, the access to the windows is far less satisfactory than you expect it to be. I strongly believe that if they want to charge so much for being situated in The Shard, Oblix should as well provide each client with the actual benefits of The Shard’s 32nd floor! Another detail about the view is that the restaurant and the bar offer different sides. The restaurant overlooks London Eye, Houses of Parliament and all the rest of the emblematic London post cards – most people seem to prefer this option, as London is more recognizable in facebook… But I personally am a fan of the bar view – calm green hills almost as if you are in the countryside, a far more exciting side of London than its evergreens to which I am used. Now it’s up to you to think and rethink. Does the view compensate all the other plain features of Oblix, is this your kind of place – because if you feel comfortable around familiar styles, people and dishes, then Oblix would actually prove a very suitable place. Is it too pricey or are you determined to get that view whatever it costs you? Generally, I would say it’s worth it; especially for tourists. You can choose among many Shard children of course, but Oblix, with its surprisingly acceptable service quality, is not a worse option than most of the others. Just don’t put off making a reservation unless you secretly want to avoid Oblix and its height!